After all, it’s 2014 not 2104. 90 years is a bit ahead of time…not to mention presumptuous that the company is still going to be around then. It could be, but there’s no sense tempting fate. Of course, maybe they just named it the TrueValue Fall 2104 reunion for some reason despite the fact that it occurs in the year 2014. Or, it might just be a typo. Still, it amused me enough that I had to say something about it. 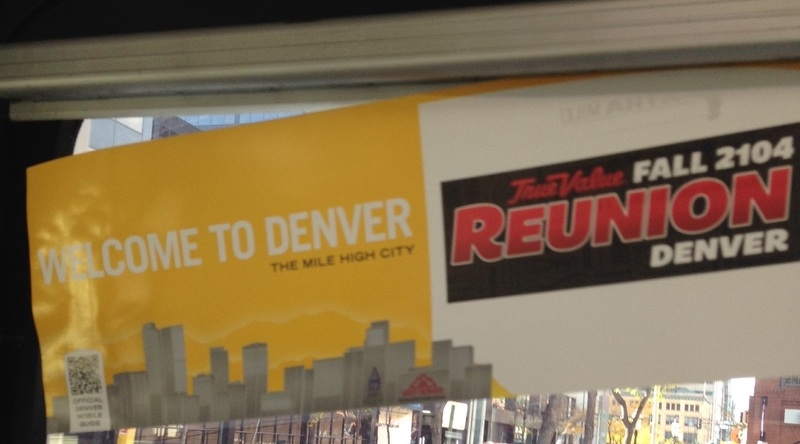 This entry was posted in Uncategorized and tagged 16th street mall, 16th street mall denver, Denver mall shuttle, Denver mall shuttle sign, It Might Be Early To Advertise That Denver TrueValue Reunion, mall shuttle, mall shuttle sign, true value fall reunion, true value fall reunion 2014, true value fall reunion 2104, true value fall reunion denver, true value hardware, true value reunion, true value reunion 2014, true value reunion 2104, true value reunion denver, truevalue fall reunion, truevalue fall reunion 2014, truevalue fall reunion 2104, truevalue fall reunion denver, truevalue hardware, truevalue reunion, truevalue reunion 2014, truevalue reunion 2104, truevalue reunion denver. Bookmark the permalink.